Feedback from our clients is most important to us. Client feedback enables us to continuously develop and improve our course offerings based on the experiences and opinions of former course participants. In this section, we would like to share some of the feedback that we have received from individuals and companies. We also share regular updates on our social media pages (Facebook, LinkedIn & Twitter) so please check us out if you want to see more recent updates. Jane who works in a large multi- National Tech company contacted us recently with some very good news – see below for Jane’s career transition story…. I completed the Train the Trainer course with New Links Training Solutions just before moving into my current role. It enabled me to progress my career much more quickly than I would have otherwise by giving me valuable skills – delivering training courses, assessing training needs in an organisation and designing training programmes. I think these skills are crucial for any organisation to be successful and after the Train the Trainer course I was able to apply them with confidence. The course itself was excellent – great content, a highly experienced and skilled trainer and the opportunity to learn from other learners on the course. I would strongly recommend New Links and their Train the Trainer programme for people who want to develop their skills and progress their career in training, or for more experienced trainers who want to improve. Brilliant courses and great trainers. My mum and my brother did courses here and has really helped them. All the staff are lovely and so helpful. Would highly recommend! We had a great tutor, she made learning very easy & was very approachable regarding queries. It’s a very practical course, the theories can be directly applied to practice. Training facilitator Martina was very knowledgeable & really easy to listen to & learn from. The course helps build confidence & will be useful for your career in the present or future. I now feel confident going into a security job & knowing what to do & what is expected of me. This course was highly beneficial to me. This is a very helpful course particularly to those of us that have been out of the “loop” for a while. The course was especially helpful with interview preparation & technique, CV layout & presentation and it also showed me how to compose a cover letter. The course is intense but worth the effort. You learn a lot in a short space of time and you also learn from the other fellow learners. It is about getting the right mixture of practical and theoretical. It was also good fun and the self-reflection was very illuminating. I enjoyed the course immensely. Janet, our tutor was very professional and personable, which certainly helps settle initial nerves. She was very encouraging also. The training was of a high quality and there was plenty of support online if needed. The course was very professional and of a high standard in every way because of Janet! It has been a journey! Janet’s input was personable and she was a wonderful guide. As an established independent trainer, I can now look back at the training that I received from New Links Training Solutions. Since completing my Train the Trainer course, I have established myself as a Manual Handling training instructor. This time last year I decided to add to my already existing H&S qualifications to complete a QQI Train the Trainer Special Purpose Award. Completing the Train the Trainer course helped me to structure and develop my business and with support from my tutor I added to my already existing training portfolio. One year on I now deliver manual handling workshops and QQI Manual Handling Instructor training. I am grateful to New Links for helping me to progress my career as a self-employed trainer. I have learned and gained so much from this course both on a personal level and in the learning aspect of the course. I would highly recommend this course to others. The learning that you gain plus the journey of discovery you go on. I learned a lot of insights into coaching. The experience of being a coach and the knowledge that you gain on the course is very beneficial. The course is amazing, I learned so much that will benefit both my personal and professional life. It was very enjoyable and informative course. The delivery was fantastic. I would highly recommend this course to someone else, I believe everyone should complete this course for their own personal development. It was a personal journey and I learned a lot. I would strongly recommend the course because I found it so relevant and having been given this space to discuss my practice and approach to work. I feel I am more present in the moment when working. This was a fantastic training and was very well paced and I loved how creative the trainer was in her delivery and facilitation. I have heightened awareness around the transference projection and countertransference in my work. My learning, theory and investigating the legislation on the criminal justice act and child care act. I thoroughly enjoyed the content. It was very challenging, excited and worked really well. I loved the group dynamics. 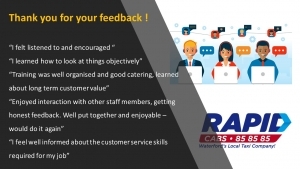 Thank you to everybody who has taken time to provide us with feedback on our training courses.